Portuguese dockers took strike action across all ports on Friday 27 July. 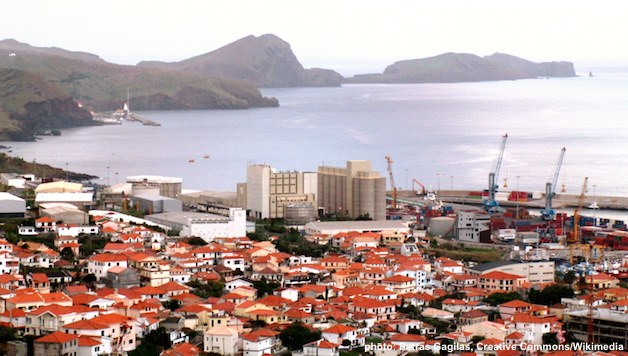 They are fighting against widespread persecution and union busting in Portuguese ports, especially in Leixões and Caniçal (Madeira), where workers are being threatened and harassed for joining SEAL – the national dockworkers union that strives to unite and fight for fair and safe working conditions and contracts. The strike had 100% participation, with all the ports either completely shut down or seriously slowed down. In a marvellous example of working class solidarity, dockers in Lisbon also struck in solidarity with their victimised colleagues. This led to attacks by the bosses who used it has an excuse to rip-up a collective bargaining agreement agreed two weeks ago. The 27 July strike was not only about union busting: it is also about supporting and defending precarious workers, fighting against labour practices which force young, precarious workers to accept less than half the wage of other workers. There are reports of precarious workers who affiliated to SEAL being arbitrarily downgraded in their responsibilities and attempts to bribe these workers with thousands of euros to disaffiliate. Unfortunately, other so-called unions, supported by the bosses, have tried to divide and disown this strike. However, the strike had an overwhelming effect in all ports where SEAL has a presence. Continuing the action from the 27th, a four-week ‘strike’ (overtime ban) against the excessive hours that dockers are obliged to work has been announced across all ports in Portugal. It will run from 13 August to 10 September. This is particularly significant as most dockworkers have already reached their annual legal limit of 250 hours of overtime. The only reason why they are forced to work more hours, especially in the Leixões Port, was due to a legal opinion from the Mobility Institute (the national body responsible for the coordination of transport, under the Ministry of Economics) which says that weekend and holiday work does not constitute overtime! The Portuguese dockers, following their prolonged strike and demonstration of 2016, have again sent a powerful message to both bosses and workers. To the bosses, they have made it clear that they will not accept their attacks and attempts to divide, casualise, or slash the labour rights of the workforce. All dockers, independent of their workplace or type of contract, deserve safe working conditions and decent wages and rights. To all workers, the dockers’ action shows the power of the organised working class, and what fighting, democratic, member-led unions can do. As the slogan from 2016 said: “Precariousness? Not for the dockworkers, nor for anyone”.